I read this book at the suggestion of my friend, Sky. 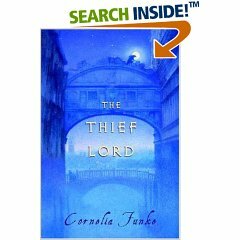 The Thief Lord is a tale of a group of orphaned children who are hiding out and "making a living" in Venice. Two brothers, Prosper and Bo, run away from their aunt and uncle following the death of their mother. The boy's aunt and uncle were granted custody of Bo but they did not wish to care for Prosper. In the effort to keep the two together, Prosper takes Bo to the magical city of Venice that their mother told them about, convinced that it would prove a Heaven-on-Earth experience. Once there, the boys meet up with a small group of other children who are, simply put, little thieves. The story is basic in nature but related in such a way that it held my attention. I really like Funke's ability to tell a story. I think she does it well. I was kinda surprised that the story wasn't as magical in nature as Inkheart, which is the first book I read (and loved) of hers. I just assumed her style was to weave the impossible into her tales. By the time I reached the last 1/4 of the book my suspicions were confirmed. Magic IS Funke's theme and it is delightful. The story boils down to events surrounding a magic merry-go-round that, if ridden, can make its rider either older or younger, as they wish. Two of the story's main characters are presented with a choice to either ride the merry-go-round and, by doing so, become adults OR to decline a ride and stay the age that they are (11 or 12). One of our characters chooses to take a ride. The other does not. Although Funke doesn't bring this pivotal piece of equipment in until (virtually!) the very end of the story, she sends a message loud and clear: every age is an enjoyable one to be! The message reminded me of the same that Joshua Harris gave at one of his New Attitude conferences for teens. That is? Every age is a moment in time that cannot be replaced so enjoy it to the fullest. Be that 14 or 40. The moment isn't meant to be wasted. I believe Funke made the point just as well. By riding the magic merry-go-round, one boy lost the chance to experience the remainder of his childhood. Another character rode in order to become younger and realized afterwards that he lost the rights/responsibilities he had spent a lifetime achieving. Both characters ultimately lost an important season of their life. The winner of this story is clearly the one who chose to remain exactly the age he was, even though that meant sacrificing what he most wanted in the moment. He choose responsibly and was rewarded for his decision. Given the fact that so many of us waste time wishing for a different season of life to be upon us, this book is a healthy reminder that we should be thankful that we don't always get what we wish for! I view this book as being akin to a parable in nature. It's a fun way to impart an important message. It even reminded me that I should be grateful for my seven week old and not wish for him to be 18 months old (which, frankly, I've been wishing)! Week 7 lasts only a week. Month 18 will be here before I know it! I really enjoyed this book, even though I thought the first half was rather slow. But again, I found Funke a charming change of pace and a unique story-teller. I'd definitely recommend this one. The final part of the Inkheart triology, Inkdawn, is due to be released in October 2007! Here's a blurb about the movie. Paul Bettany is playing Dustfinger (and, btw, I had no idea who Paul Bettany was) and he looks like how I pictured Dustfinger in my mind's eye. I'm WAY HYPED about this movie! PB plays Chaucer in A Knight's Tale and the albino monk in The Da Vinci Code...but then you probably know that by now. Carrie, this sounds like a great book. My TBR list just keeps getting longer and longer. . . . I haven't yet read Inkheart either. I don't know if my brain is addled by motherhood and "old age" (ha--36), but I find books to be slow in starting more and more lately, so I persist.